Not to be outdone on the “have we all lost our minds?” scale, newly elected Virginia Governor Ralph Northam, when asked about the failed bill, was quoted as basically advocating infanticide. “If a mother is in labor…the infant would be delivered. The infant would be kept comfortable. The infant would be resuscitated if that’s what the mother and the family desired, and then a discussion would ensue between the physicians and mother.” Didn’t you just hear: Have the baby and then we’ll decide? Governor Northam, a pediatric neurologist by training, later denied he was advocating for the killing of newborns, even those with life-threatening deformities. This is the new face of the pro-choice movement. Long gone are words about making abortion “safe, legal and rare.” These have been replaced with admonitions to “Shout Your Abortion” and t-shirts that say, “I love people who’ve had abortions,” adorned with little hearts. So be ready North Carolina! This battle is coming to our state. 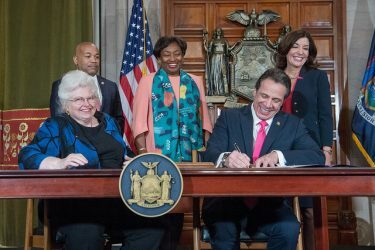 Pro-life lawmakers in New York held off a version of their bill for 12 long years before 8 new pro-abortion lawmakers were elected, giving them a majority. Days after they were sworn in, they passed this radical new law that legalizes abortion until birth and removes any protections for unborn children at any point in the pregnancy. Here at NC Family, we have always understood the importance of family-friendly public policy on the state level. We recognize that what we do in North Carolina reverberates across the nation to other states and is often reflected in what happens on the federal level. We all need to be ready. Please educate yourselves on this and other vital issues and be prepared! Your resolve to stay informed and to spread the word to your networks across the state might be our best chance of helping to ensure that North Carolina is one of the most family-friendly and pro-life states in the nation. For the sake of life and for the good of the family, we thank you!